When immigration is in the headlines, the context is often politics, legislative reform, and harrowing stories of survival. 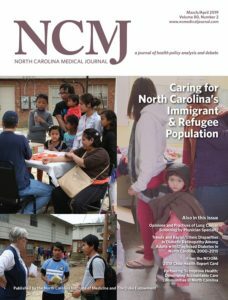 For the latest issue of the North Carolina Medical Journal, we took a closer look at what happens when immigrants and refugees settle in a new place and, like all other residents, require medical care. North Carolina has long been a hub for immigrants and refugees from around the world. As of 2017, 7.8% of our population was foreign-born, according to the U.S. Census Bureau. The state ranks 10th in the nation for number of refugees settled; in 2015, more than 3,000 refugees settled here, with 2,200 more following in 2016. The state and our many local, regional, and practice-specific programs strive to meet the medical and mental health needs of all our residents, but unique challenges and barriers to care remain. Interpretation services can be difficult to obtain, even where legally required; toxic stress is prevalent among patients and burnout can be a problem for the clinicians who treat them; varying explanatory models of disease and cultural customs can create discomfort and confusion in the exam room; and the harsh realities of migrant farm work and human trafficking take a toll. “Health care clinicians can provide a level of security and trust for immigrant and refugee patients that is otherwise lacking in today’s political climate, and have the opportunity, if not obligation, to engage in immigration policy,” write guest editors Jeffrey Walden, director of the Cone Health Family Medicine Refugee Clinic in Greensboro, and Holly Sienkiewicz, director of the UNCG Center for New North Carolinians. Toward that end, clinicians and other experts from around the state have provided commentaries on the following topics. Click the titles below to read their work, and feel free to reach out to our managing editor, Kaitlin Ugolik Phillips, with any questions at kaitlin_phillips@nciom.org.